This truly beautiful house stands in 4 acres of private land, in the heart of Bodmin Moor. You can see the famous landmarks Brown Willy Tor and Rough Tor from the windows and you can step out directly for breathtaking walks far and wide. Wild ponies and long horn cattle come and graze directly outside the gate. Because the house has no direct neighbours there is no residual light and the night sky has been declared an "international dark sky landscape". The night sky over Bodmin Moor is rated amongst the best in the world. 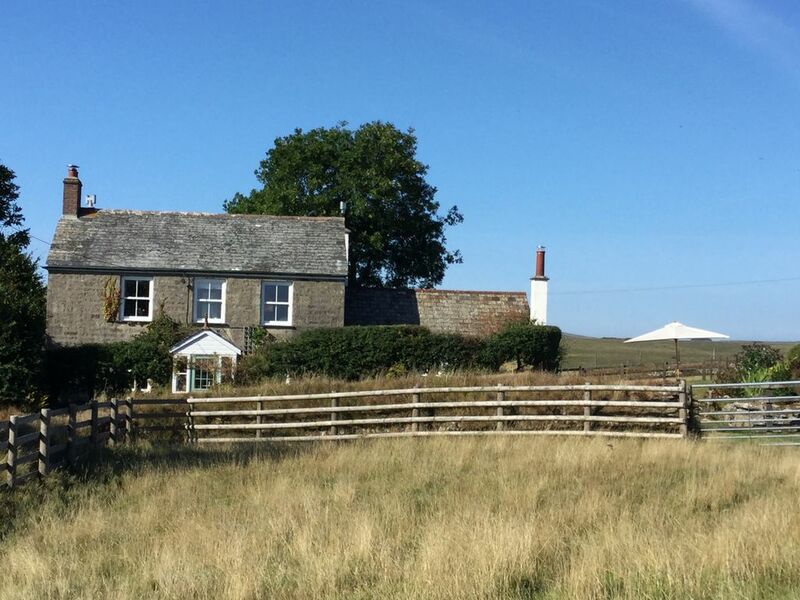 The house provides the perfect stopping-off place for exploring the Cornish countryside and is only 40 minutes from Polzeath, Port Isaac and Cornwall's many beaches. The villages of Blisland and St Breward are a ten minute drive away from the house and there is a great riding school less than five mins away (Hallagena). The house is spacious and is always cosy and warm. You can enter the house through the front porch or, as of course we all do, directly into the kitchen, or when the wellies are muddy via the back door into the utility room. There are original, large Cornish slate tiles throughout the ground floor. The Kitchen has a large vaulted ceiling and windows on all sides with truly fantastic views over the moor. There is a large, oak table and chairs for 6-8; an AGA stove and a modern electric cooker; an oak french dresser; large fridge; drinks fridge; well stocked utilities (magi mix etc); pots and pans etc. Off the kitchen is a Utility room with French dresser stocked with all the basic cooking necessities (flour, rice, pasta, spices etc) which guests are welcome to use. There is plenty of space for coats, boots, and a brand new washing machine and separate dryer. There is a ground floor toilet/shower room. Also on the ground floor is the spacious living room with two sofas, fantastic log burner, arm chair and comfort for all. TV/DVD, DVD's, Chess and plenty of board games. Internet is high speed BT broadband (Cornish speed). Off the living room is a study/single bedroom with its own oil burner; study desk; and single bed. Outside the kitchen is a garden seating area with table and chairs and BBQ. There is a larger garden area to the South with its own boundary (dog inclosure) and a (wire covered) pond. There are two fields around the house (often with the local farmers sheep in) and some private outbuildings (barn/old stables) on the far side of the land which are not included in the rental but largely unused (except occasional access for owner). There is a separate "play" field surrounded by granite stone walls which guests are welcome to use. Upstairs there are 4 bedrooms and a bathroom all with amazing views. The master bedroom has a brand-new kingsized bed with memory foam topper; an ensuite shower bathroom; chaise lounge and storage cupboard. There are 2 further double bedrooms with wardrobe and chest of drawers; and 1 kids room with two single beds (truckle bed). The bathroom has a large comfortable bath with shower head. It's a special house that we are proud to share. Friday to Friday bookings. Can be varied if adjacent weeks are not booked. Arrival from 3.30pm and departure by 10.30am. My husband is a keen surfer and I love horse riding so this is the perfect house for both of us so keep entertained. You can walk directly out onto the moors and walk for miles.